Many people get asked to introduce a speaker at an event and have no idea how to do it. In this quick guide, we give you several different frameworks that you can use, as well as plenty of sample scripts and explain the questions you must ask both your speaker and your client before you start. Why do we introduce a speaker or performer? It settles the audience down and gets them focussed on the stage. It gives a chance for the Production crew to correct the sound levels, lights and be ready with any audio/visual cues. It lets the audience know who this person is before they start, in case there is no printed program. It can link the content or the message of the speaker to the theme of the event. So, as you can see there is a lot going on behind even the simplest of introductions! Before you start writing a Speaker Introduction! Before you start writing an introduction, find out, does the speaker have a prepared Introduction? If the person presenting is a professional speaker, e.g this is what they do for a living, they should have a standard introduction already prepared for you or better still, an introduction they have prepared specifically for this event. They will understand the importance of the introduction and how it can help them and their presentation succeed. In reality however, not all professional speakers will provide you with a prepared introduction and most other non professional speakers will not provide one at all. They may not even be aware that they can do this. What you will get in most situations is a Biography, which is not an Introduction and shouldn’t be read out “as is!” This is one mistake many people make. We will show you later in the article how to convert a Bio into an Introduction. If you do get an introduction, either supplied by the booker, the client or the speaker themselves, use it as written. Don’t attempt to improve it. The only time to do this is if you see some glaring error or you really need to cut some time off, but you are going to find most provided introductions are carefully crafted and most will be quite succinct. If you do add anything, say it before you start the provided introduction and then end on their words. 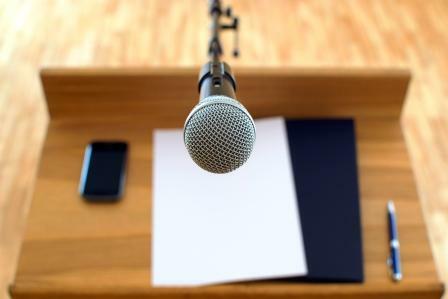 Speaking of time … if a Speaker does provide you a long winded introduction or insists that a video highlights package is run before they come on stage, make sure this is included in their presentation time! I normally start timing a speaker after I leave the stage and they have started, but if they insist on a really long one or play a 5 minute video first, that should be part of their allocated time. There is a bit of a trend for having a video play before they actually come on. It really is part of the presentation..
Notice, I have been referring to provided Introductions. These are not Biographies! Often you will be provided with a Biography of the Speaker. The Client has probably recieved this from the Speaker or copied it from their website and it was useful to them in selecting the Speaker for the engagement. But these are seldom useful as Speaker Introductions. A Biography, like a CV that you put together to help you obtain a job, lists all your Qualifications, Achievements, Career Highlights, Publications, Awards etc. But your audience doesn’t really need to know all this! They don’t really care. They want to essentially know just three things. Is the Speaker qualified to talk about the Topic? Don’t fall into the trap of just reading out a long Biography that you are given. We will show you later in the article how to quickly craft a strong Speaker Introduction. It’s always a good idea if you can check directly with the speaker that the topic of their speech is unchanged. Many speakers get booked many months before their presentations. In the case of large international events this may even be a year or so prior! In some cases a speech Topic or Title may change. The speaker may in fact have a totally different theme or presentation to what’s printed in the Agenda or in the notes provided. If you craft a wonderful Introduction, touching on the theme or the importance of the speech, it helps if it’s in alignment. Firstly, you should if at all possible talk to your speakers before you introduce them. There are many reasons for this, that we have discussed here. During this conversation you can check that the title and topic is much the same. Secondly, if the Speaker has a Powerpoint Presentation to accompanies the speech you can usually see the first slide. This should alert you to the fact of a change early on. You will either see this when they are setting up on stage or you may be able t see it at the Audio Visual Desk if it is being controlled by the AV Team. If you see there is an obvious change you can then find out more and alter accordingly. We already have a specific training that covers all the questions you should ask your client before an event, but here are a few that specifically relate to the introduction. What is the purpose of the whole meeting? Why did you choose this speaker? Will I be provided with a Biography or a set Introduction? The answers to these questions should provide you with a fairly solid base to work from, especially if you are going to follow the Introducing a Speaker Sample Script outlined below. Here is a very solid framework to start with that I have used for many years. The Speaker Introduction has 4 parts that address a different question in turn. Why is this subject important? This allows you to start with a bang – to pose a question, state an alarming fact, interesting insight or staggering statistic. What you are trying to do here is to grab the audiences attention, stop them thinking about the previous presentation or even just to look up from their phone where they have been checking their email. It can be as short as just a sentence or perhaps two or three to frame the topic. Next you need to establish the credibility of the speaker. This is where you mention some of the highlights taken from their Biography. Choose the most significant ones and importantly, the ones that relate most to the topic and theme. You are positioning the speaker as the best person give insights and solutions to the subject. You now build a link between the Subject and the Audience. How does this subject effect them directly. Why is it great to be learning this now? What is the benefit to them? What are they going to get out of it? Why should they pay attention right now? In Sales terms.. you heard about the pain, now here is the solution! You are picking up the momentum and building a little excitement. Combining these 4 Parts together has a nice flow to it and it builds up to a strong finish. It’s usually better to end with the persons Name as the last thing you say. If you were introducing me for instance you could say …. Depending on the circumstances you should really try and keep a Speakers introduction short and tight. You can pack a lot into just 2 minutes! There’s another element that you can add into any introduction and that is a more personal touch. This requires that you can contact the speaker before the event or at least have a few words with them on the day. What you try and find out is some personal anecdote or connection that you weave into the speaker introduction. As you can see these questions go beyond the normal level of formal introductions and add something a bit special. It also allows a bit of humour. The other question I get asked a lot is “Should I give the speaker introduction and then leave the stage or should I give the introduction and then wait for the speaker to get to the lectern / centre stage and then leave? My feeling on this is you should wait at the lectern and there are a number of reasons for this. I like to control the audience focus! If I walk off before the speaker comes on, the audience don’t know where to look. I like to give the Speaker Introduction and gesture towards where they are coming from. Once they are onstage and moving to the centre, everyone will be looking at them. I then move slightly to the side but wait for them. Once they nearly get to the speaking position I extend my hand in welcome, shake hands and then leave the stage. However, I don’t completely leave. Speakers sometimes are nervous, they might drop their notes, fumble with the control button for the slides etc. I’m close enough that I can respond if needed. Once they start I can then proceed completely offstage. One of the joys of being an MC is that you get to meet and work with some amazing speakers. Over the years I’ve introduced – famous Sportsmen, Entrepreneurs, Explorers, Prime Ministers, Astronauts, Inventors, life changing Surgeons and many more.